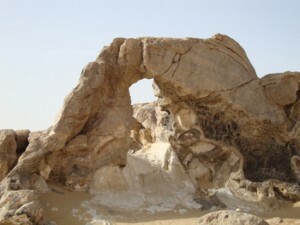 Gebel Izaz or Crystal Mountain is situated between the Baharyia Oasis and the Farafra Oasis, in the northern part of the White Desert. Despite its name, the Crystal Mountain is not really a mountain, rather a rock or ridge sparkling like a crystal. It is an unusual hollowed circular stone imbedded with crystals. A stop here, however, is definitely worth the time, because it is a perfect spot for lovers of natural rock formations, who adore watching the enchanting quartz crystals. The sun rays make the big rock with its arch to spark even more. The man-high arch is natural and small and is situated in the centre of the structure. Geologists, who studied the Crystal Mountain, think this structure was once a cave made from limestone and completed with stalactites and stalagmites. This cave was shook by the earth movements and while time was passing by the roof was destroyed by erosion. Others think the Crystal Mountain has a sub-volcanic vault dating probably from the Oligocene age. The layers of chalk from the White Desert and the limestone, the coal and the ferruginous layers of brownish and reddish colours are dating from the Cretaceous age. The layers are broken and folded. The crystals have also an interesting history. The anthracite came from the coal seam. The calcite crystals came from the hydrothermal solutions which had a big concentration of CaCO2, which came from the chalk. These solutions came in all the cavities and after the solutions cooled, the crystals increased. If you visit Crystal Mountain, you should know that it is not indicated to break parts from the arch structure. There are numerous crystals spread around on the ground that can be taken.